Hay-on-Way - Town of Books, is world famous for its second hand bookshops, and is fast gaining a reputation for its antiques, collectibles and other fiercely independent shops. The town lies on the south-east bank of the River Wye and is within the north-easternmost tip of the Brecon Beacons National Park, just north of the Black Mountains. Hay-on-Wye, has two Norman castles within a short distance of each other. Lying close to St Mary's Church on the western edge of Hay-on-Wye is a small but well-preserved motte. The main fortress, Hay Castle, is a medieval fortification and 17th-century mansion house. Originally constructed as part of the Norman invasion of Wales, the castle was designed as a ringwork overlooking the town in either the late-11th or early-12th centuries. It was rebuilt in stone around 1200 by the de Braose family and then had a turbulent history, being attacked and burnt several times during the First and Second Barons' Wars, the wars with the Welsh princes, the rebellion of Owain Glyndŵr and the Wars of the Roses. In the 17th century a Jacobean mansion house was built alongside the medieval keep and the property became a private home. Serious fires in 1939 and 1977 gutted the castle and, despite repairs in the 1980s, by the 21st century much of the building was derelict and unstable. Since 2011 it has been owned by the Hay Castle Trust and work is due to start on the renovation of Hay Castle during 2018 to create a unique new center for culture and education. Once a sleepy market town famous only because Francis Kilvert, the diarist lived nearby for nearly two decades in the mid nineteenth century. There was also a local solicitor who got rid of his wife in the early twentieth century by putting weedkiller in her breakfast. On 1st April 1977 this all changed when Hay-on-Wye was declared an Independent Kingdom by the self-proclaimed King of Hay, Richard Booth, along with his horse as Prime Minister. With his cardboard crown, and a sceptre made from a ballcock, he set out to put the town on the map. Improbably, he succeeded. He made it world famous as ‘the town of books’. 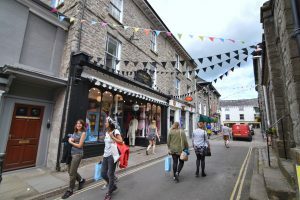 Although only a relatively small market town today's Hay-on-Wye is friendly, lively and vibrant with many facilities, including a cosy, inviting, 65 seat Cinema and is also world famous for the annual Hay Festival of Literature & Arts held for ten days at the end of May. Produce Market - held every Saturday throughout the year, 9am-5pm, in the Cheese Market, off Memorial Square. Offering delicious homemade pastries, cakes and treats, artisan bread, African rugs and baskets, and handspun yarns and woolen items. Friday and Saturday Flea Market - Held most Fridays and Saturdays from February through to December, 9am-5pm, in the Butter Market off Market Street. The Friday and Saturday Flea Market sells an eclectic range of bric a brac, antiques, collectibles, jewellery, books and vintage items from local traders. Friday Vintage Market -Held every Friday from March through to October, 9am-5pm, in the Cheese Market off Memorial Square. The Friday Vintage Market is a dedicated group of vintage specialists selling a range of vintage clothing, from 1950’s tea dresses to converse footwear, to vintage accessories, collectibles and homeware.